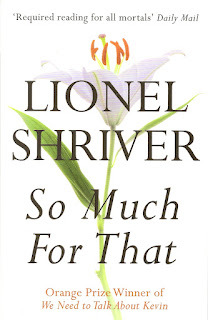 Book Review: Lionel Shriver's "So Much For That"
Home » books » death » new york » review » Book Review: Lionel Shriver's "So Much For That"
I recently read on some unremembered blog that Lionel Shriver should be dismissed as the kind of author who writes books for book groups. Aside from being an unfair attack on authors who write work with a mass appeal, I think Shriver has more to offer than 'just another bestseller'. I reviewed "We Need to Talk About Kevin" here, and felt it was a worthwhile read that raised some interesting questions. So when I was going on a post-Christmas book binge with my gifted book tokens, I spotted "So Much For That", read the blurb and decided to give it a try. It's been sitting on my book shelf ever since, primarily due to it being a hefty 500+ pager. One of my favourite holiday luxuries is lazy mornings reading, and my little trip to Edinburgh allowed some time to turn to Shriver's difficult novel. The novel primarily follows the story of Shep Knacker, an industrious American businessman who has saved all his life in order to have enough money to move away from America and live out his life (with his family) in Africa. As is the case with many people's dreams, this one has been put off for many years, and it suddenly seems it won't be possible at all when his wife Glynis is diagnosed with mesothelioma, a rare and deadly form of cancer. Shep is forced to abandon his dream, and to keep working at a job he hates so Glynis can have access to his health insurance. Alongside this, the reader is introduced to Jackson, Shep's long time best friend and colleague, his wife Caroline, and their terminally ill daughter Flicka, who was born with a degenerative disease called familial dysautonomia. I know, I know, you're wondering why on earth I would choose this book for holiday reading... In my defence, I didn't actually realise that the book was so focused on dying. The blurb is slightly misleading, in that it claims to be a book about the difficulty of marriage and relationships, and while it is, it also deals with the difficulty of taking on the role of carer when someone you love is terminally ill. However, what I like about this book, is that while it has the potential to be a soppy tear-jerker, that only tugs on the readers' heartstrings (the same kind of emotional fluff as "PS, I Love You" or the film "Seven Pounds"), it doesn't do that. These stories have their place, but usually rely too heavily on their tear jerker factor, without any real depth, substance, or character development. Instead, Shriver presents us with a dying character who doesn't want to admit she's dying, and who behaves quite appallingly to those around her. It takes a very long time for Glynis to even come close to accepting her fate (and I'm still not sure that she does). Add to the mix Flicka, the intelligent, sarcastic and downright angry teenager, and we have something very different to a tear jerker. We have something that questions the value of human life, and explores the very essence of human suffering. The book is not all doom and gloom, and Jackson's often arbitrary rants about the US government, unfair taxation, and the health system provide some entertaining, and dare I say, amusing scenes. And of course, the novel deals with the horrendous medical system in the United States (this is really what attracted me to it). It was enlightening to find out that even those who pay for a health insurance policy can run up huge debts when it comes to prolonged medical treatment, and this point is poignantly made through both Shep and Jackson's stories. There is a powerful scene towards the end of the novel between Shep and Glynis' consultant, where he asks how much time the treatments bought his wife. The doctor replies 'A good three months', to which Shep points out that they were not a 'good' three months. If I had to come up with a criticism, it is that some of the 'explanation' surrounding the American health care system is delivered in unrealistic conversations that come across as contrived, but I can forgive her this, as it was a learning experience for me, and because her choice of subject matter was far from easy. 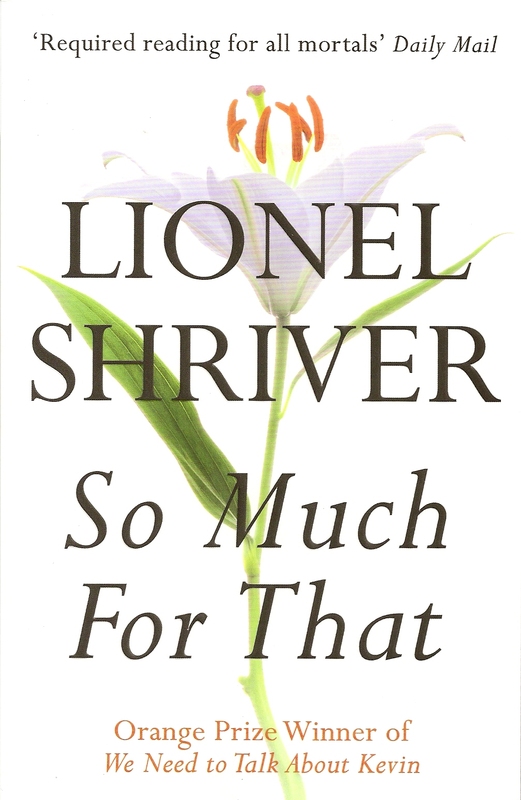 Once again, Lionel Shriver provides us with unconventional characters who approach life and death in different ways. It is a difficult read for anyone who has experience of cancer, or other terminal illness, but it's ultimately extremely rewarding, and a 'must read' for anyone who has ever said a bad word about the NHS.